The R 13 Prestige is one of the top clarinets in the R 13 bore family. The Grenadilla wood is carefully selected for its acoustic and aesthetic qualities and the wood is carefully polished and left in its natural color. The mechanics are prepared and finished with great precision: milling holes inside the specifications according to the Buffet Crampon expertise. The Buffet Crampon R13 Prestige was for many decades the top model in the R13-bore family. It is built in A, Bb. The R 13-Prestige was mainly known in the US and England, but we see an increased popularity also in Europe, due to the success of the other R13 type models like Festival, Vintage, Tradition and Tosca. The sound is carrying, full and warm. The R13-Prestige is delivered with the left hand Eb/Ab key. 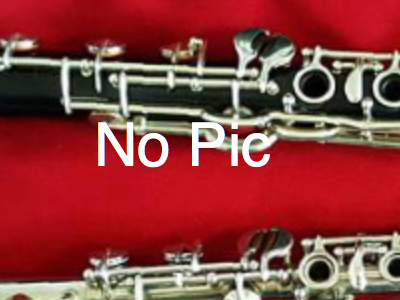 NEW ,Since 2016 are all Buffet Pro-clarinets equipped with an adjusting screw for the left-hand F/C key. This enables the player to adjust occurring disturbing key-play on that key. Lohff and Pfeiffer offered this feature since the 80th as an option. This is stall available for older instruments. The R13-Prestige is only available in unstained, polished African Blackwood. To reduce the risk of cracking, Lohff & Pfeiffer offer the tone hole crack prevention for all wooden instruments as an option. Attention: Often, the R13 Prestige and RC Prestige are just referred to as Prestige, without the important distinction between the two. They are very different in sound concept, intonation, feel and resistance!